Stones Restaurant was a Roadfood Icon in central Iowa. Its classic sign sticks above the viaduct, reminding those driving by that this restaurant has been here so long it predates the modern road built above it. After closing earlier last decade, it briefly reopened by the Stones before closing again. Only in 2009 did a new ownership group attempt to bring this place back to life. "Since 1887" reads the front of the restaurant, and many people in the area have memories of eating here from long ago. Location: 507 South 3rd Ave in Marshalltown, Central Iowa. Under the viaduct, beside the busy railroad tracks. Directions: You have to drive around a corner if you are on the viaduct in order to reach the parking lot. There is an illustration on the business card. 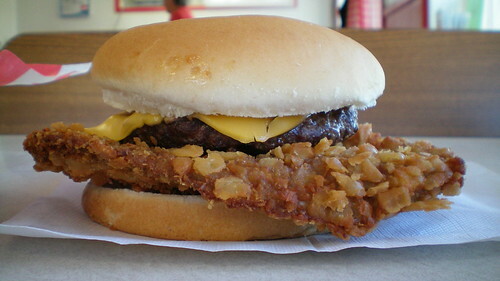 The Tenderloin: This had a good size, decent thickness and looked clearly homemade. The breading became a little dusty. There seem to be parallel marks across the top from storage or something. The whole thing had good size and white meat. Served on a roll with all the fixins. Overall 7.0 out of ten. Also on the menu: The lunch menu has diner classics on the menu like hot beef or smothered steak sandwiches along with homemade daily specials. The usual fried appetizers are not available here. Service: Its only table service as far as I could tell. Ambiance: The remodel and reopening work has made this place into a trip back in time. There are high ceilings and natural light, along with period music and vintage decorations. Final Thoughts: People returning to a place that has been closed a few years may be in for some surprise changes. The Mile-High Lemon Merengue Pie, listed on the DM Register's 100 Things to Eat in Iowa Before You Die, is no longer on the menu. I am optimistic about the new owners and what they have done with the place. I was never able to visit here before it closed, but the remodeling and careful attention to atmosphere is noticeable. So many places like these close, it is rare to see one make a comeback. The tenderloin is alright. However, I left wishing I had tried one of the daily specials instead. FYI....Stones is closed yet again and has been for about a year or so. Also...thanks for doing this blog! I love stopping in to read about the good loins I should try when I'm in the different parts of the state. I've been told by a good friend and tenderloin connesiur that the Elm's Club in Creston has the best loin in the state. .